139 years ago this November, SBAI’s namesake, Rochester’s own Susan B. Anthony voted in the 1872 presidential election. She was later arrested with three of her sisters and other local women who had also voted illegally. 48 years later, and 14 years after her death, the U.S. government passed the 19thAmendment, giving all American women the right to vote. American women have now had the right to vote for 91 years, so it may seem shocking that last night Monroe County elected its first woman District Attorney, Sandra Doorley. It may be even more shocking that the Village of Seneca Falls, which is the site of the first Women’s Rights Convention lead by Elizabeth Cady Stanton (who would later become one of Susan B. Anthony’s good friends) and home of the Women’s Rights National Historical Park, a national landmark preserving the site of the convention, did not elect its first woman Mayor, Diana Smith, until 2004. 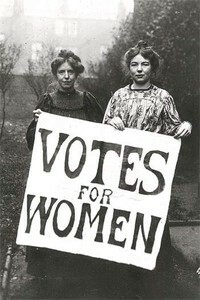 More shocking still is the reality that in 2011, 91 years after women gained the right to vote, women do not nearly make up half of elected officials. According to the Center for American Women in Politics at Rutgers University, women make up 16.6% of Congress, 21.1% of Statewide Executives, and 23.6% of Sate Legislature. Yet, there’s hope! This election season two women were on the ballot in Monroe County facing off for the County Executive seat: Sandy Frankel and Maggie Brooks. Maggie Brooks, the incumbent, was herself the first woman to be elected County Executive of Monroe County. These local victories should not be overlooked, especially these first women in our area that are preserving Rochester’s long history of women’s leadership. Though, today I am wondering – how do we keep this momentum up? How do we encourage more women to take leadership roles? As a professional in Higher Education I may be biased in saying, education. More women today are entering colleges than men, for the first time more women were awarded PhD’s than men, and Women’s Colleges are partnering to create better leadership programs for students. So, keep it up ladies, let’s get closer to representing our half of the population. For more first women in our area and nationally check out the Anthony Center for Women’s Leadership at the University of Rochester’s First Women site. This entry was posted in Community and tagged #anthonycenter, #election, #SusanBAnthony, #vote, #women'sleadership. Bookmark the permalink.